Aman Haque | Haque works at the boundary of several exciting fields including MEMS, sensors, nanofabrication and nanoscale behavior of materials. Aman Haque (Professor of Mechanical & Nuclear Engineering) works at the boundary of several exciting fields including MEMS, sensors, nanofabrication and nanoscale behavior of materials. Haque (pronounced "Hawk") arrived in January from the University of Illinois, a December 2002 graduate in mechanical engineering. 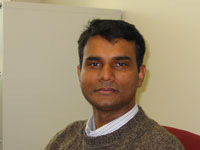 His doctoral research involved investigation of length scale effects on mechanical properties of nanoscale thin films. Using MEMS fabrication techniques he was able to pattern intricate force-displacement devices onto silicon wafers then etch away the silicon leaving free standing test structures that were thin enough (20-200 nm) to perform quantitative in situ tensile tests inside a TEM and an SEM. The fabrication methods permitted him to incorporate critical alignment features in his test rig; the lack of these alignment tools limited the ability of previous researchers to quantify their data. The image below shows a low magnification SEM micrograph of the test rig. Another benefit of the experimental design was that because the films were adhered directly to silicon there was no need for an external means of gripping the sample, simplifying the analysis. His work at Illinois focused on metals such as gold and aluminum. Below roughly 50 nm grain size the mechanical behavior of materials is not adequately predicted by bulk materials theory partly because of the lack of dislocations (in the image below, see crack propagation in a 100 nm thick aluminum specimen with no dislocation activities ahead of the tip). In general metals become more elastic and less ductile. Other phenomena, observed in metal films for the first time are non-linear elasticity for grain sizes below 15 nm, and absence of work hardening. The results of these studies are currently under consideration for publication in Nature. At Penn State he plans to take the basic knowledge that he has learned about nanoscale testing of metals and apply it to more complicated materials such as ceramics, ceramic-metal interfaces and nanocomposites. He sees opportunities beyond mechanical testing in areas such as sensors, heat transfer and tribology. Haque has spent much of his first two months at Penn State meeting people, recruiting graduate students and planning for a new graduate course for mechanical engineering in engineering opportunities in MEMS and nanotechnology. For more information about Prof. Haque's research, including a video of crack nucleation and failure in a thin film, visit his personal webpage.